WHAT IS ALBERTA 55 PLUS? Alberta 55 plus represents the heart of mature Albertans. It stands for the idea of a fuller, healthier, more vital future; for the straightforward steps that can be taken towards that future. We promote participation and action and have generated a unique spirit of cooperation across the province. The association believes that sport and recreation development for mature adults is a provincial issue. It has a direct bearing on the quality of life in this province and it can become a way of life for the individual and the province as a whole. That is the ideal. We’re working to make it a reality. to act as the provincial voice of mature adults in the Alberta 55 Plus Games; and promote future Alberta 55 Plus Games. A Board of Directors, with an executive and representatives from 8 zones across the province, is established. Consultants from Alberta Sport, Recreation, Parks & Wildlife Foundation provide assistance and support. Areas of financial assistance include Alberta Sport, Recreation, Parks & Wildlife Foundation, donations, and our membership fees. 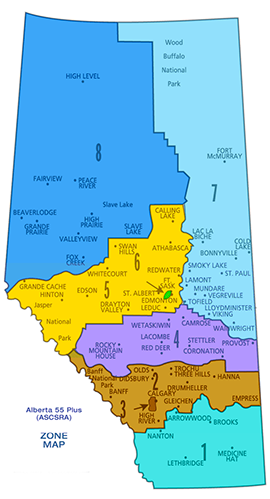 Each of our 8 zones must have an executive and board elected or appointed from established areas in the zone. Through these zone boards, local needs are identified and addressed by the Provincial Association. Given the inherent physical, emotional, psychological, intellectual and social benefits for persons 55 plus years of age who pursue an active lifestyle, Alberta 55 plus shall initiate and sponsor activities which support these benefits. Plan workshops to expose local mature adults to the association and show them how they can be an integral part. Provide resource people and set up instructional demonstrations to develop and promote the games of pickleball, floor curling and other recreational activities. Give talks to groups concerning the role of the association, future plans and other related topics. Offer three types of memberships: Individual, Club, and Affiliate. Issue newsletters to all members. promoting and/or supporting 55 Plus Games on a national level. Bylaws can be viewed on our Bylaws page here. Our Policy document can be viewed here.